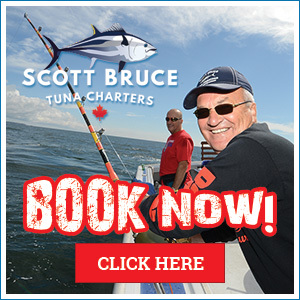 Scott Bruce Tuna Charters is located in Prince Edward Island, off the coast of Nova Scotia, Canada. We fish out of North Lake, PEI – known as the “Tuna Capital of the World” – one of the few places you can catch a 1000 pound and greater Bluefin tuna only a few short miles off shore. Scott Bruce Tuna Fishing Charters is pleased to offer you your own private boat charter. When you book your PEI tuna fishing trip with us, it will only be your party and our crew onboard. Whether you are an avid big game sport fisherman or a beginner angler, we provide all the tackle, equipment, and training/education you need to have a fun and memorable time out on the water. Full day charters increase the odds of catching a giant Bluefin tuna by providing more fishing time increasing the chance of hooking up. Full days also allow more sailing time to travel to where the fish may be located that particular day. Sport fishermen know catching fish is never a guarantee so we recommend booking 2 – 3 fishing days if your vacation allows. For pricing and more information, please contact us by calling 902-969-7059 or emailing brucestunacharters@gmail.com. Pricing is based on a group rate for 1 – 6 people per day. The tuna fishing chartering season on PEI operates from mid July to mid October. 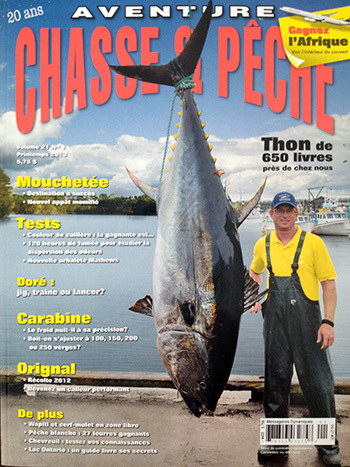 Perfect if you would like to try your hand at tuna fishing but are short on time. Coming Tuna Fishing with Us? Here’s what to expect. While there is no typical day for Bluefin Tuna fishing, there are some constants. Once you are settled onboard and safety procedures have been explained, we depart the harbor and cast lines in search of bait fish. While we normally have chilled bait on board, we also like to have live bait in our live well tanks to use as more-natural lures. You are encouraged to join in on catching this bait fish and most people usually have so much fun doing so that it is hard to get them to pull in their lines and go tuna fishing! Once we have our bait, we’ll head out to deeper water (however, we can always see the shore) where we will set up our gear and explain what procedures to follow once we hook a fish. Waiting for the big one to bite is a great time to unwind, enjoy the scenery, watch the sea birds and swap fishing stories. Then, out of the blue…. the elastics holding the slider on your pole snap from the line going tight, followed by the screaming of the reel as the line starts peeling off at speeds of up to 60mph. Even though the captain and crew have prepared you for this moment, you are still amazed by the power of the fish and how quickly the captain and deckie get the other lines in, start the boat and get you working the fish on the live rod. Hooking up is half the battle. Few fish are tougher than tuna. Success depends on one’s fortitude to reel in these giant fish. Even the most experienced angler can tire quickly but it’s the adrenaline that keeps you going. The PEI tuna charter fishery practices catch and release, so you can’t take the tuna ashore. But don’t worry! We get the tuna as close to the boat as we can before it’s released to give you time to celebrate and take pictures of your trophy catch. Catching one of these giant, elusive fish is a rare privilege and deserves the time to take a few moments to soak in your remarkable achievement. At Scott Bruce Tuna Charters, we never forget that tuna are living creatures. We use barb-less circle hooks to minimize any stress and we always treat these massive and beautiful fish with respect and admiration.